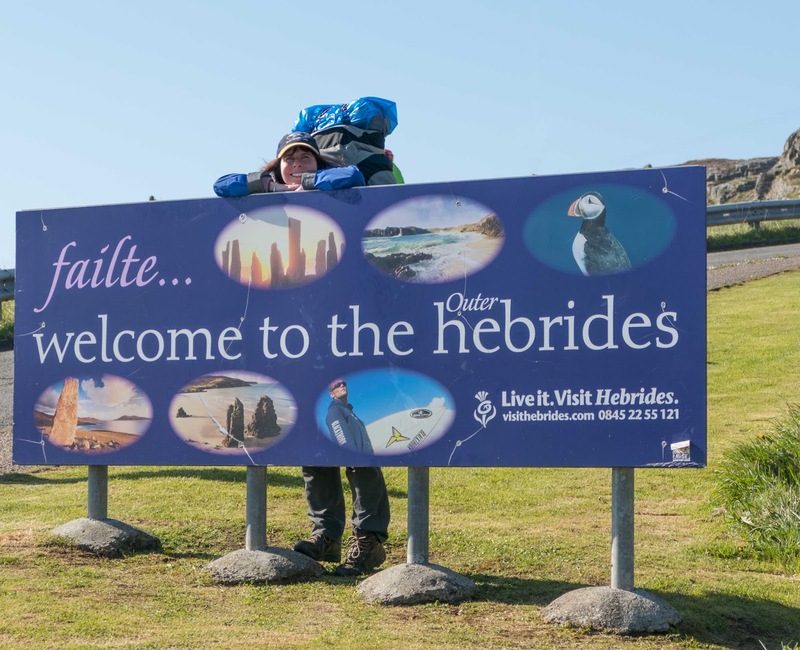 Combining walking with heavy packs to hopping on local buses and dropping off our luggage at hostels while we explored on foot with day sacks, we cherry picked our route along the newly opened Hebridean Way, visiting 8 stunning islands between Vatersay and Stornoway. ‘Stop! Stop!’ cried the American woman as she rushed past us down the train carriage. ‘My husband's not on the train,’ she continued, while hurrying towards the guard as we pulled away from the station. At this point, she disappeared into the carriage behind me and I'm afraid I do not know what happened to our American visitor who was left penniless and phoneless at Crianlarich station but the train didn't stop nor did it go back for him. Instead, it carried on to catch the Oban to Castlebay ferry where our adventures began. 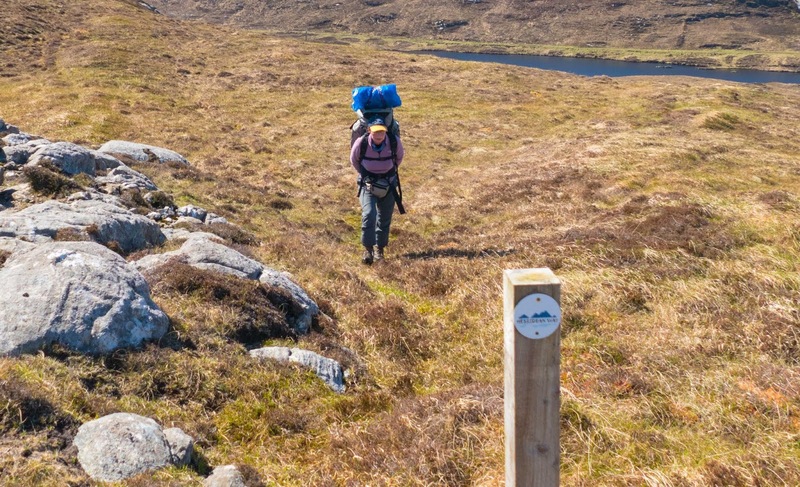 It became apparent after 2 days of walking with full packs, covering a distance the guidebook reckoned we could do in a day, that walking the whole of the Hebridean Way was going to be much harder than we'd prepared for and take considerably longer than we'd allowed. Unlike some other long distance walking routes, the Hebridean Way walking route is practically void of shops and cafes which meant, at the speed we were walking, about 1mph on day 2, we had to carry nearly 10 days worth of food with us just in case we didn’t come across a shop and for someone like Tony, who is used to a skinny wet latte at 10am every day, it was even tougher. 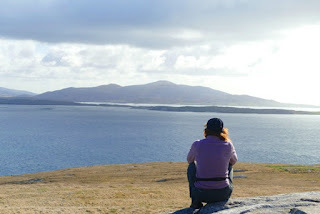 We’d only been wild camping for 2 nights but excitement burst from us like a giant party popper when we discovered that the ferry terminal at Eriskay had a shower. The freezing temperatures of the north Atlantic, despite its beautiful turquoise colour on silver sandy beaches, just didn’t tempt me. Not only was there a shower in the ferry terminal but a heated waiting room too. I let Tony shower first while I sorted out the packs away from the wind. Armed with his towel, and a pound coin for five minutes of hot water he went off for a lovely warm shower. 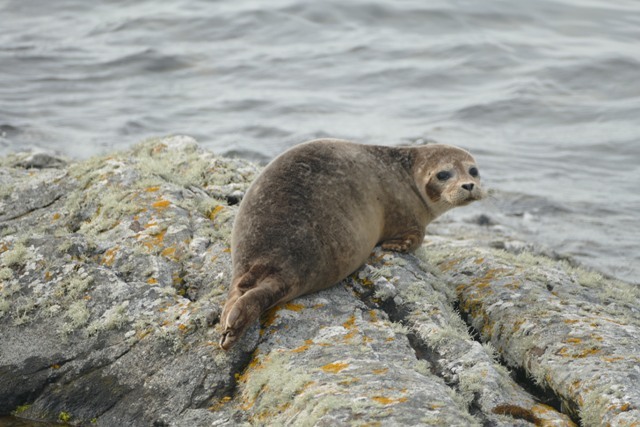 It was really early, about 5.30am and the only other living creatures around at that time was a black rabbit, obviously no raptors in this area, a sea otter lying on his back munching on his fresh catch and a seal. “How was your shower?” I asked when he emerged from the cubicle. “Cold!” he replied. Wanting to get his money’s worth, he had stripped off, turned the water on and then reached over to put his pound in to find it didn’t fit as the meter hadn't been updated to take the new pound coins. Luckily the hot tap in the ample sized very clean toilet cubicle dished out hot water for nothing. We camped by the sea at Berneray, an idyllic tiny island at the top of the North Uist and to be honest, anywhere would have been near the sea on the island but we were only a few feet from the high tide mark. From our tent, we had 5 star views of the islands in the Sound of Harris, a great vantage point to spot dolphins, orca and otter. 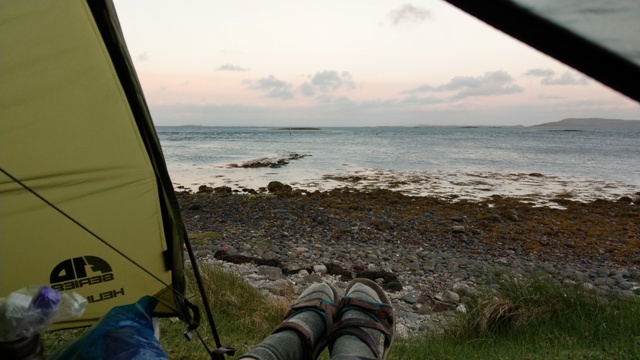 The wind had dropped too and we fell asleep to the sound of the waves gently swishing over the rocks as opposed to the wind rustling the tent aggressively as we usually experienced. We weren't the only ones who thought this was a fine place to spend the night though. During that annoying middle of the night toilet run, the rocks a few feet from our tent started to moan. I couldn't see what it was but I soon realised who the omoaner was when the noise was accompanied by a pungent, rotten seaweed combined with fish aroma that wafted into the tent. I was just thankful that it was only the smell and not the whole seal that had entered the tent. The mysterious Callanish standing stones form the oldest stone circle in the UK, even older than Stonehenge. Although they are not on the Hebridean Way walking route, it is worth taking the bus from Stornoway to see them while they are still relatively unknown. Callanish Standing Stones - There are two other stone circles within walking distance of these ones. Currently there are no restrictions on how close you can go to the stones and the visitors centre is a bargain at £3.50. However, that doesn’t mean you can sit around drinking coffee if you get there early and think you’ll have the stones to yourself. ‘There's four coaches arriving in the next hour’ said the driver to the girl serving behind the counter. Hearing that announcement, we swiftly downed our coffee and stuffed the apple pie down our throats. There was no more relaxing in the cafe, we had to get to the stones before the coaches arrived or our pictures would look like Clapham Junction at rush hour. I don't really think this needs a caption - it's just Wow! Definitely! I have unfinished business with the Hebridean Way. For a start you owe me an orca sighting. But the walking route is so new that there are sections where so few walkers have tread that there isn't even a path yet and Tony struggled to get through the day without a large skinny wet latte, so perhaps we’ll wait for the infrastructure to catch up with the popularity of this new route. 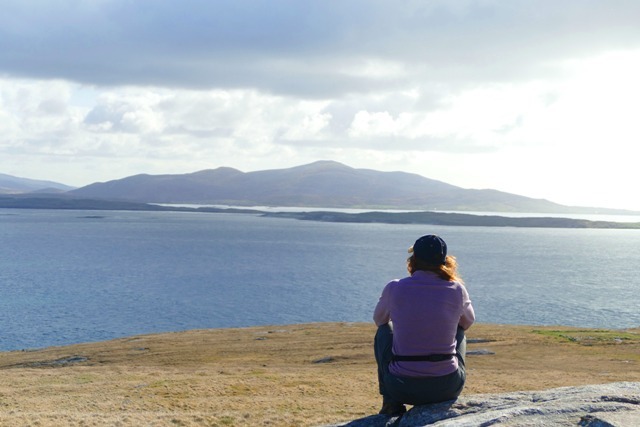 But I’ll definitely be back to revisit the Outer Hebrides. 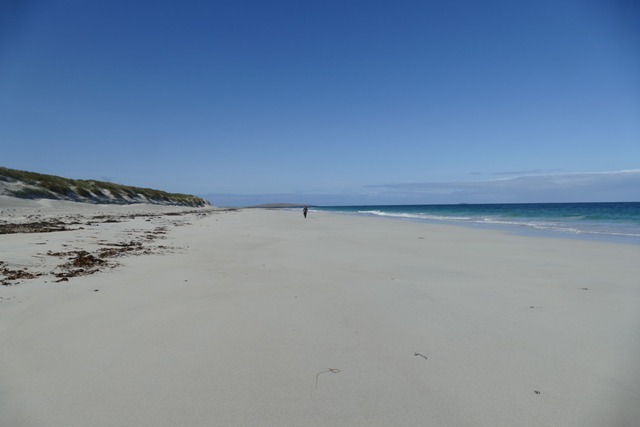 Like most of our trips, our plans changed as frequently as the weather in the Outer Hebrides. Our trip may have been beset with silly problems, from lack of food shops and unwelcome cold showers to sharing a camping spot with a seal but at least we weren’t left stranded on the platform at Crianlarich Station.